What do you do with the bike that your kid outgrows, too quickly it seems, but the bike is still in good condition? If there are no younger siblings, or if your son wouldn't be caught dead on his older sister's pink princess bike, just what can you do with it? Well Lenni Eubanks of Toronto thought hard and long about how to make a difference and the solution she arrived at was My First Wheels. Starting in 2009 Lenni has distributed over 600 bikes to kids who needed a first bike. Thirteen year old son Owen helps his mom with many aspects of the program, including nightly preparation of bikes to be distributed. Owen also promotes the charity at his school. 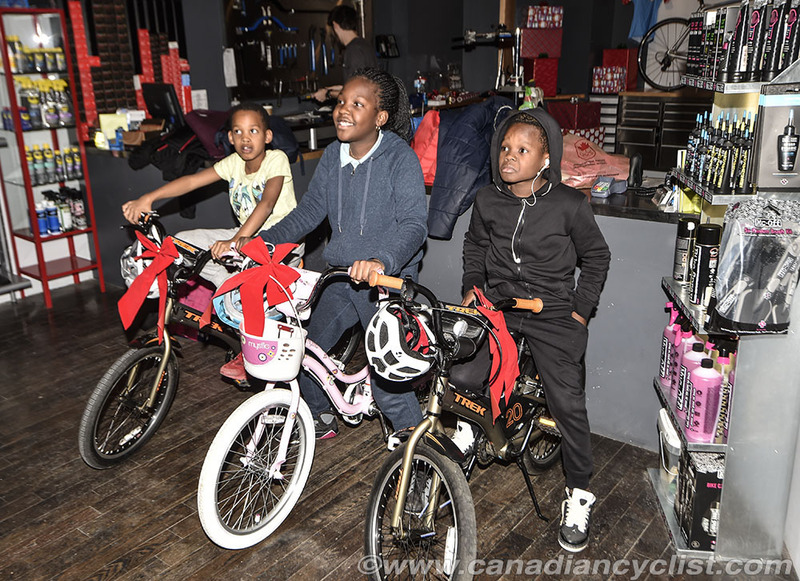 On Thursday, December 1st, we met with Lenni and Owen at the Trek Store Toronto, where members of the Jane and Finch Boys and Girls Club were given bikes and helmets by Lennie and store owner Barry Near. I had the chance to talk to Lenni about the origins of the program and some other projects she has added along the way. "I had been trying to find a way to give back to the community for some time," explained Lenni, "and I tried a number of things but nothing really stuck. One day I was on my bike, on my way to work and was thinking 'what can I do?' I really wanted to do something important but it has to be something important to me, I want to make a difference." "I looked down and it just happened. It was that moment I realized l needed to find a way to give kids a bike, because a bike made a difference in my life. I would not be where I am today guaranteed if it wasn't for my first two wheels." "I didn't set out to start a charity, I just thought let me start this summer on a little project to see if I could get a couple used bikes, clean them up and then find someone who could use them. It started there and it snowballed. There was such a positive response from parent and friends that I turned it into a charity." "I do it now in the spring and summer. I have a day job and needed it to be something I can always do, and can afford to do it. To keep cost down it is all online; I rent a storage unit only for those months. I often pick-up and deliver [the bikes] myself." "I started out taking in bikes that need a little bit of repair, but that became unmanageable. So I decided to tweak my model a bit, to where I accept bikes that are like new and ready to go. That way I cut the need for too much back and forth transportation." 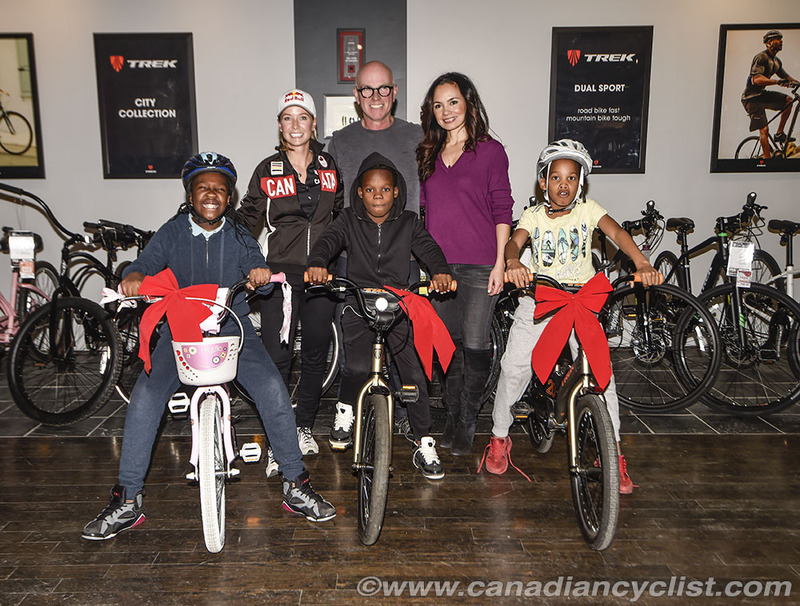 "I really want to replicate the sense of joy a child gets when they get their first bike. That first bike should be shiny and beautiful. I want that wide eyed 'Oh my gosh' feeling. I would rather donate one bike and change one kid's life than donate thousands that are rarely used." Lenni has expanded her idea to include bike camps. "I want to empower youth in communities. They need to see role models like them that live in their own communities. So I came up with the idea of sponsoring a bike camp. A lot of children who live in low income neighbourhoods can't afford even the most basic of camps. Even ten dollars a day is out of the question." "So I sponsored a camp where for free they get to go to camp, learn safe cycling, proper helmet fit, bike repair; everything around cycling. They go on safe rides, the police come in and do a little bit of training. I also encourage youth in the community to volunteer and they too get the whole experience. I want to begin the cycle of confidence, empowerment and building kids up. All centered around the bike." "I was able to sponsor the first camp due to a program available through the public schools called youth philanthropy initiative. I won a five thousand dollar award and the idea for the camp was born. Last year my camp was for the Jane and Finch Boys and Girls Club. Camps are now paid for with any additional money left in the program after paying for the bike storage and helmets." Want to contribute to My First Wheels? Contact Lenni at donate(at)myfirstwheels.ca .